Visiting Cincinnati? This budget friendly tour is for you! Don't let the name fool you. This 3 hour morning tour showcases the city and delivers a satisfying lunch! 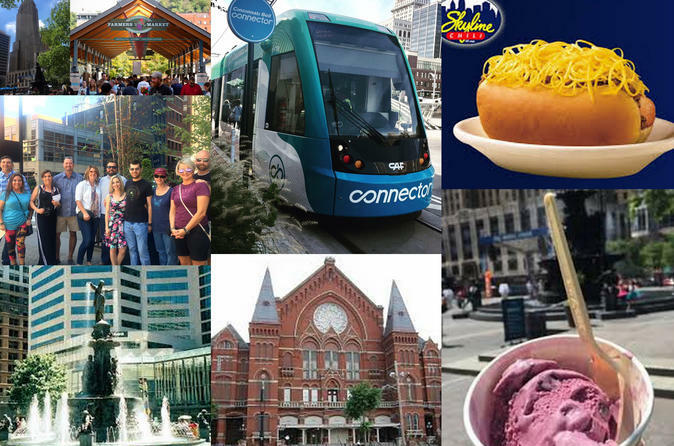 Discover the 5 mouth watering dishes that Cincinnati is known for and visit the top 10 must-see sites with a friendly local guide. From the banks of the Ohio River through downtown Cincinnati through 2 parks, an historic neighborhood and Findlay Market, we saw it all! How do we do it all? We hop aboard the Cincinnati Streetcar. When the tour concludes, you will have enjoyed a satisfying lunch, receive an all day streetcar pass, a streetcar guide and knowledge of the city, so you can continue your explorations with confidence! We begin at 10:00am, so you have the rest of the day to yourself to enjoy. We begin our tour at the best known waffle restaurant in Cincinnati where we enjoy our first tasting. Next, take in the view of the Ohio River as we stroll through Smale Riverfront Park. Before our eyes is the iconic Roebling Suspension Bridge. This bridge was the predecessor of the Brooklyn Bridge and is the most photographed site in Cincinnati. It’s a beauty! As we head north two blocks, we are surrounded by the home of the Cincinnati Reds, the first baseball team in America. On our left, you may hear the rumble of the jungle where the Cincinnati Bengals reside. As we approach the National Underground Railroad Freedom Museum, there is a piece of history that’s too good to miss. Next it’s time to hop aboard the sleek new Bell Connector as we head to our second tasting. This Cincinnati favorite is so popular, that we consume over 2 million pounds a year! We need to work up a little appetite, so we stroll to the heart of the city: Fountain Square. The centerpiece is a public work of art - refreshing to look at and to taste. What?? Speaking of refreshing, it’s time to cool off with our third treat. Yes, this is the spot that people make a beeline for as soon as they land at the airport. It’s that good! Right across the street is our next site, the beautiful 1920’s French Art Deco Carew Tower. We’ll stroll inside the arcade to catch a glimpse of famous Rookwood Pottery. Did you know you can ride an elevator to the 49th floor for a view of the entire city? One more stop to the Contemporary Art Center. We’ll get a quick overview and you can return anytime you like because it’s free all day! Back on the streetcar, we head north to Over the Rhine. We are crossing into little Germany now and we don’t even need a passport! OTR, as the locals call it, is jam packed with restaurants, shops and bars. And it’s the perfect location for our fourth stop. I hope you like sweets, because these Cincinnati treats are show stoppers. Next we walk a block west to another beautiful 8 acre park. This park is bordered by the magnificent Music Hall which has a haunted past. It’s time to catch the streetcar for our final stop at Findlay Market, the oldest urban outdoor market in Ohio. The market is enticing and full of fragrance and color from the ethnic foods to the beautiful produce and flowers. You will want to linger all day and since you have an all day streetcar pass, that’s works beautifully. But we have one more tasting. You cannot visit Cincinnati without trying goetta. Never heard of it? Good, we like surprises! Our lovely adventure through the Queen City has come to a close. We will happily return you to our starting point or, now that you got the lay of the land, you can continue on your own. Either way, your local guide will be happy to share additional tips or answer any questions, so you can carry on with confidence!